One of the most difficult for scalpers before entry is determining the strategy. There are complex trading strategies and there are simple ones, and making plans for entry with certain strategies for scalpers does not have to be complex. This article exemplifies a simple trading strategy with the CCI (Commodity Channel Index) indicator for scalping. Only 3 steps need to be taken, namely determining the direction of the trend, determining the entry momentum with the CCI indicator, and determining the exit level according to risk management. 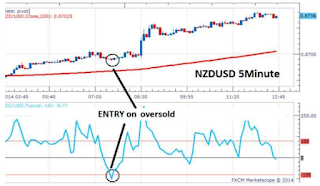 Scalper usually uses a time frame of 1 minute to 15 minutes. 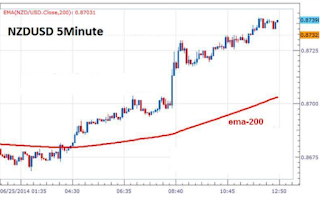 To determine the direction of the trend, an exponential moving average (ema) indicator is usually used. 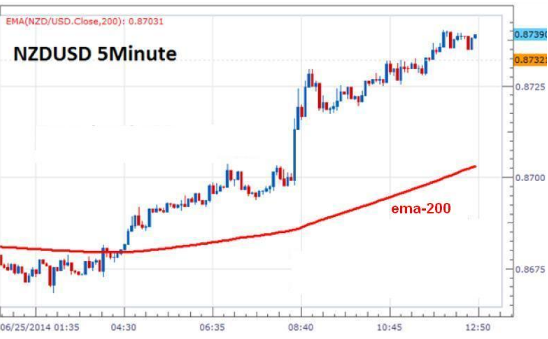 In the example of the following NZD / USD used ema period 200. If the price moves above the ema-200 curve then it is assumed that the trend is bullish and the trader will wait for opportunity to buy, conversely if the price moves below ema 200, traders wait for sell opportunities. From the picture above, it seems that the price is still trending strongly as indicated by the distance between the closing price and the wider ema-200. In addition, price movements also formed higher high levels (new high levels higher than previous highs) and higher lows (new low levels higher than previous lows) which are characteristic of uptrend movements. Because trading with a time frame is low, after knowing the direction of the trend the trader must immediately determine the momentum of the entry before the momentum disappears and the trend changes. One indicator that can help determine the entry momentum is CCI. In addition to being used to find out overbought and oversold conditions, the CCI indicator also shows the cycle of price movements or moments of trend direction changes, namely when there is a divergence between the direction of price movements and the direction of movement of the indicator. Because in this example the uptrend price movement, the trader will wait for the oversold situation to enter, ie when the CCI is below the -100 level as shown in the picture above. Conversely, for sell entry, it is only done if the price moves below the curve of the ema-200 indicator and the CCI indicator shows an overbought condition. READ TO What is the Meaning of Spreads and Their Effects in Forex Trading? Risk management is crucial in scalping because usually traders will enter several times a day. Traders can use the extreme level (high or low) beforehand as a stop loss level, or by determining the stop loss level on the curve line itself. The risk / reward ratio does not have to be high, but try to be greater than 1: 1. 0 Response to "Simple Strategy for Scalping"